Tell El-Amarna was formally known as Akhetaten. The new name came from a local village called El- Till. The word Amarna came from the Bedouin tribe that settled in this village. The word Tell, in Arabic, means a mound or a small hill. But interestingly enough, Tel El-Amarna is a flat piece of land beside the Nile Valley. The ancient name, Akhetaten, means the horizon of the solar disk. It is very similar to the meaning of Amun Dwelt at Thebes, Ptah at Memphis and other gods at their favored places. King Akhenaten offered this place to be the home for his god Aton. The area is a plain field, separated from the Nile Valley by a strip of palm trees. It stretches 12 kilometers from north to south. 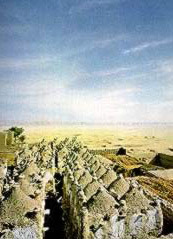 The area is covered mostly with sand and outlined with ruins of temples, palaces and houses that archeologists discovered or are trying to find. Some tourists considered it one of the most romantic places they have ever seen because of the silence and the peaceful beauty that the area gained through the centuries. There are more than twenty five tombs facing the base of the cliff front. Six tombs are located at the north side near Darb El-Malik. Nineteen of them are located at the south side. If you are going to navigate through the tombs, we do recommend a tour guide to be with you for safety reasons. These tombs were built highly complicated to protect them from the thieves, therefore a visitor could get lost. Most of the tombs start with an open court that leads to three chambers. Some of the tombs are decorated with papyrus columns that meet at a recess in the rear end which have a statue of the deceased looking toward the entrance. The famous lyrics of the Hymn to the Sun, which was composed by Akhenaten, is always found in the decorations of each tomb. The following section describes the famous tombs located in Tel El-Amarna. This is considered to be the finest tomb remaining in the necropolis. The drawings show Ay and his wife receiving gold collars from Akhenaten and Nefertiti while the surrounding crowd seems cheerful by this honor. There are some descriptive scenes for the streets of ancient Akhetaten which are closely observed and described. Other drawings describe a few intimate moments in the palace of Ay; a woman of the harem having her hair done, other girls are playing the harp and dancing, while others clean the house and prepare the food. In the same temple, the most complete and correct version of the Hymn to the Sun is decorating the right hand side of the doorway. Huya, or Yuya, was the steward of Queen Tiyi, the queen mother and wife of Amenhotep III. A Royal banquet is located to the left and right of the main hall. The banquet contains drawings for the king, queen and their children. One of the walls has a drawing for the king accompanying his Queen Tiyi to the Sunshade temple that was erected for her. Meri-re II was the superintendent of the palace of Queen Nefertiti. A unique drawing on the right wall features a celebration to honor leaders from other countries that brought some exotic gifts to the Queen. The visitors are shown in their native dresses. Other drawings show the celebration and the Pharaoh's hospitality. He was a high rank priest of Aton. A table full of offerings including a beautiful representation of a colorful rainbow is drawn on the left hand wall of the main chamber below the Aton disk. On the right hand wall, a scene of the Aton Temple which shows a depiction of the Akhetaten harbor, the palaces and the gardens of the ancient city. He was the chief servitor of the Aton in Akhetaten. The facade that decorated the outside of his tomb is still preserved. A group of Aton worshippers are featured on the top of the outer lintel of the entrance. The group of the featured Aton Disk worshipers include the king's sister and two of her servants. In the corridor walls of the tomb, the deceased is featured as an elderly man sitting beside his daughter.